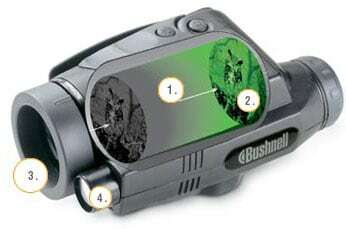 Whilst the marketing jargon on the Bushnell night vision website that claims "These optics turn night into day" is stretching the truth, for a Gen 1 Night Vision Device the Bushnell 2.5 x42 Night Vision Monocular does offer excellent night vision at a very competitive cost. This Bushnell Night Vision Monocular (Model No: 26-0200) has a good 42mm Objective lens for gathering any light available as well as a pretty good 2.5x magnigication, about average for most night vision binoculars and monoculars. They have a great close focus of distance of 4ft (1.2m) and can view objects up to 600ft (183 meters) away. All night vision equipment needs some light to work, they can rely on just the moon or stars for light, but if there is no external light source available the built-in dual-level (high and low-intensity) infrared illuminator will allow you to see even in the darkest conditions. They do this by sending out a beam of infra-red light that is not visible to the human eye, but is picked up by the night vision device. The rugged compact design of these 2.5x42 night vision monoculars from Bushnell means that they comfortably fit into the palm of your hand. The included hand strap makes them easy to hold, in a similar way as you would a camcorder. To power the monoculars they take 2AA batteries and have a mount for tripod use and come with a carry case. 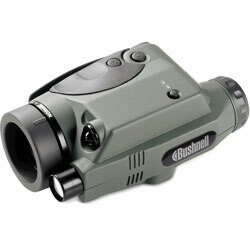 Overall I would say that for the price they offer excellent value for money and make an ideal chap night vision device for many applications including camping, observing nocturnal wildlife as well asfor some security surveillance uses like nightime warehouse and garden security that is stealthy, something that no flashlight can offer. Any available light (energy) is collected by the objective lens (3) and focused on the image intensifier (1), Inside the intensifier a photocathode is "excited" by the light and converts the energy into electrons. The electrons accelerate across an electrostatic field inside the intensifier and strike a phosphor screen (2) which emits an image that you can see when you look through the monocular. 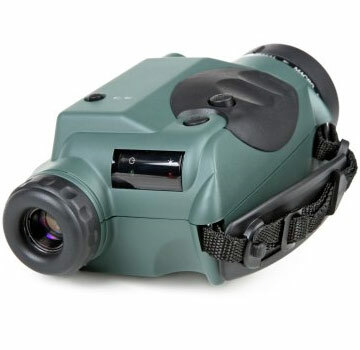 For a good pair of night vision binoculars, take a look at the ATN Night Scout Night Vision Binoculars, or if you want goggles that you can fit to your face for hands free use, the ATN Viper Night Vision Goggles are worth considering.